Lexicon Encyclopedia of Science by T. McCorry (Editor) Hardcover Publisher: Lexicon Pub (June, 1988) ISBN: 9990795142 List Price: 179.50 Comments: 5 volume HC set, no dustjackets, clean pages, tight bindings on all volumes. 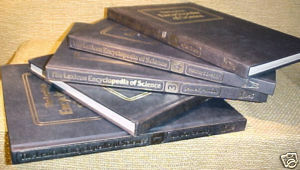 The set includes Volume One: Absorbtion-Chemistry; Volume Two: Chromatography-Geology; Volume Three: Geometry-Motion; Volume Four: Motorcycle-Solar; and Volume Five: Solids-X-Rays. 4to 11" - 13" tall. Hardcover; VG condition 5 Volumes Oversized HB with blue cloth boards, gilt lettering c.1984; Revised 1987 edition Clean pages, corners and covers ever so lightly worn The set includes Volume One: Absorbtion-Chemistry Volume Two: Chromatography-Geology Volume Three: Geometry-Motion Volume Four: Motorcycle-Solar Volume Five: Solids-X-rays Excellent reference set for your child as he/she studies science.